While I love slogan sweatshirts on other people, I never wear them myself...until now. The heavier sweatshirt material and the tight waistband always look unflattering on my body shape so the couple of times I've bought them, I never ended up actually wearing them apart from as loungewear. Equally, the messages many slogan sweats have written on them don't always sit right with me. 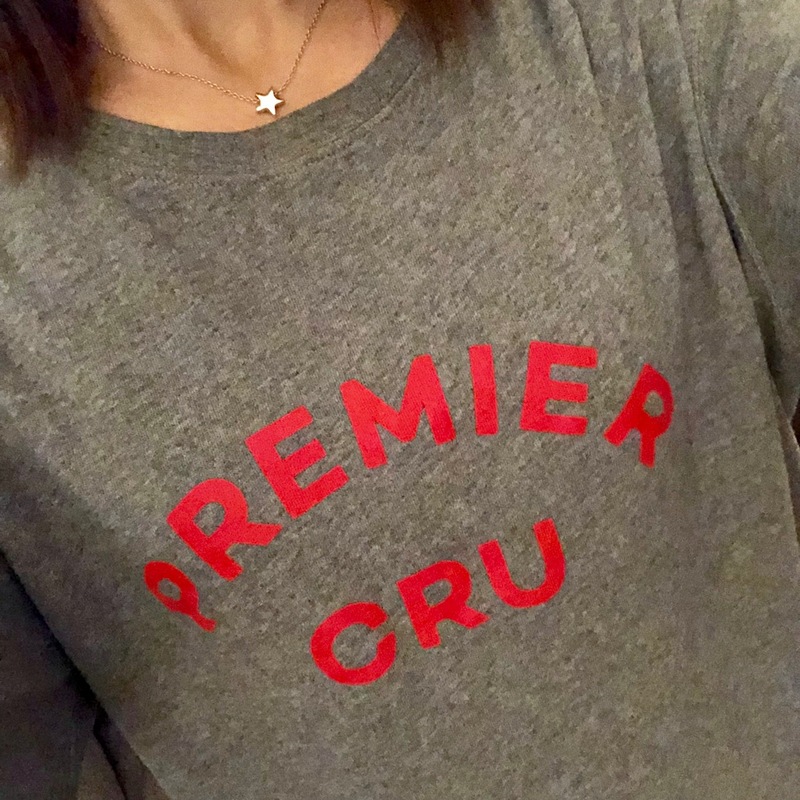 So I'm delighted to have come across FWP by Rae, completely by chance and I wore the Premier Cru sweatshirt yesterday for the first time and absolutely loved it. I say by chance because I actually bought mine from an online friend as a preloved item, rather than from the company directly. I had been vaguely aware of other people I follow on Instagram wearing the brand but hadn't really considered looking at them because I assumed they would be the usual unflattering sweatshirt shape on me. Rachel who was selling it, mentioned that it was a generous fit (too big on her) and nice and soft so I thought why not and I was delighted when it arrived because it's nothing like a sweatshirt fabric. It's a gorgeous soft lightweight material which reminds me of Pyjamas actually...and I mean that in the most positive way. It hangs beautifully and can even be tucked in. Hope your weekend has been treating you well. I've mostly spent it eating bad food and driving the mum taxi. Though I did go out with the Freedom runners this morning for the second time. Go check out Holly's Instagram if you're local. It's the most wonderful outdoor workout on a Sunday morning, suitable for all levels of fitness. Completely exhilarating...and fully legitimises an afternoon of eating more food...in my case, at my sister in law's - huge yay to not having to make Sunday dinner today. Have a good one - back soon!